Gerry & Rosie who? A little Wilson Creek Winery history. you would be running your own winery and living in Wine Country? Here lies the story of one South Pasadena couple and their adult kids who made a dramatic change. 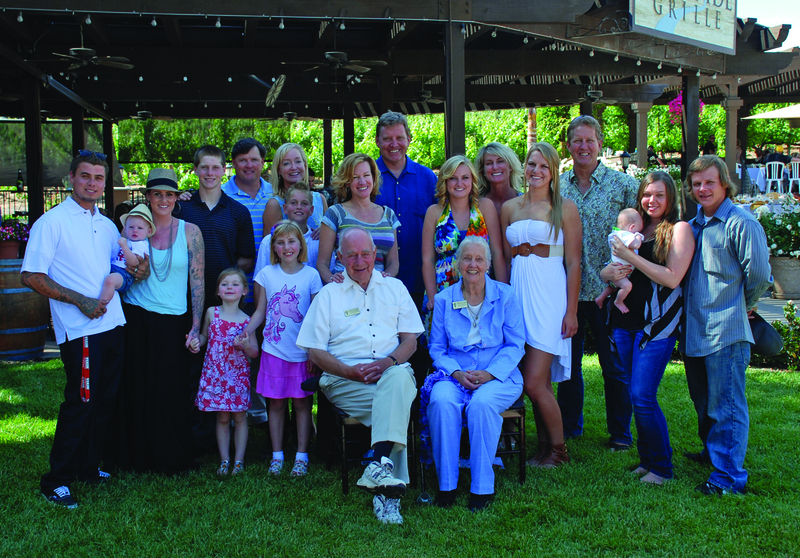 Gerry, Rosie and family gather together for a picture on Mother’s Day, in front of the Creekside Grille, at the winery. With no real background in vineyard management or winemaking and no winery built at the time, they relied on local experts in Temecula Valley to guide them. They hired a winemaker and vineyard consultant while Gerry and Bill enrolled in some winemaking classes at UC Davis. Bill drove the tractor and oversaw wine production and maintenance of the vineyard. It was quite a different lifestyle than the suit and tie lifestyle Bill and Gerry were used to, but they LOVED it! Their experience shows in the success of their numerous events: weddings, concerts and charity functions that runs right alongside of their award-winning wines. “Home of the famous Almond Champagne,” the winery has garnered numerous prestigious international wine awards, and their production has increased to approximately 50,000 cases per year. Gerry is proud that Wilson Creek is unofficially the winery of many Navy ships, including eight aircraft carriers. Wilson Creek has received several humanitarian awards and has even sparked the attention of the Hollywood film industry. Wilson Creek has been featured on the show “Radical Sabbatical” which aired on the Fine Living Network, the syndicated show “Blind Date”, as well as the MTV show “Dismissed” just to name a few. The entire family is still involved. You can feel the energy and personal touch when you visit the large tasting room. Visit with the family members who are always on the property. The ambiance of Wilson Creek continues to be very warm and welcoming. Among the many guest favorites, the award-winning Chocolate Port is served in an edible chocolate shot glass for an extra special touch. Wilson Creek is nestled seven miles East of Interstate 15 on Rancho California Road in Temecula Valley Wine Country. A mere 75-minute drive from Los Angeles and 50 minutes from San Diego make it a destination to be fully enjoyed.